Stainless Steel Name plate with Satin finish background and Cut Letters. We manufactures all types of Steel etching /Engraving signs for corporate industrial uses. 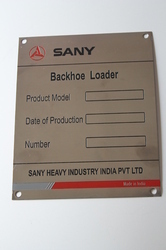 Catering to the requirements of our clients, we are involved in offering Stainless Steel Name Plate. 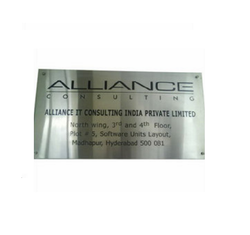 Our range of products include Name Plate such as SS Hatching Name Plate, Brass Etching Name Plate, Acrylic Name Plate, Steel Name Plate, SS Name Plate, Name Plates and many more items. Plate Size: 15" x 15"
Size of Biggest Letter: 3"
This elegant Square Bits name-plate, made from top grade stainless steel, is the perfect accessory for apartment doors. Each name-plate comes with a pair of panhead screws, washers and wall plugs so that it can be easily affixed outside your house - either on the door or besides the door. Stainless Steel Etched Name Plate.